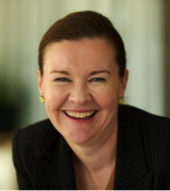 Petrina Coventry is Industry Professor and Director of Development with the University of Adelaide Faculty of the Professions and the Business School. She previously held global vice president roles with the General Electric Company and The Coca Cola Company in the United States and Asia and was most recently CHRO with Santos Ltd.
She is currently a non executive director for The Australian Human Resource Institute (AHRI), and Beston Global Foods (BFC). Petrina is a Fellow of the Australian Institute of Company Directors, a Vincent Fairfax Fellow and a Fellow of the Australian Human Resource Institute. She has a masters degree in ethics from the University New South Wales, an MBA from the University of South Australia, a Global EMBA from Sydney University and is presently completing a PhD with the University of Melbourne.